Is this server-side, or do I need to have everyone who connects to my server download and install this? I decided to get this for my medieval setup, as I was doing a ton of terraforming to flatten the land where my fortress will be, and didn't want to mess up the landscape a bunch. So I got this mod, and I'm gonna have a temp villager trading 4 emeralds for a stack of dirt. Just so I can get a ton of dirt easily in survival, specifically for that purpose. After that, I'll kill him, and uninstall the mod, and then get back to normal building. Yep, then cheated in the last few batches of emeralds to get the dirt (trust me, trading a bunch of wheat and having to wait in between trades for several minutes at a time got quite annoying). Now I'm done. Lost him to a dragon, but it was worth it. RIP dirt trader. He was crucial to my fortress being constructed. 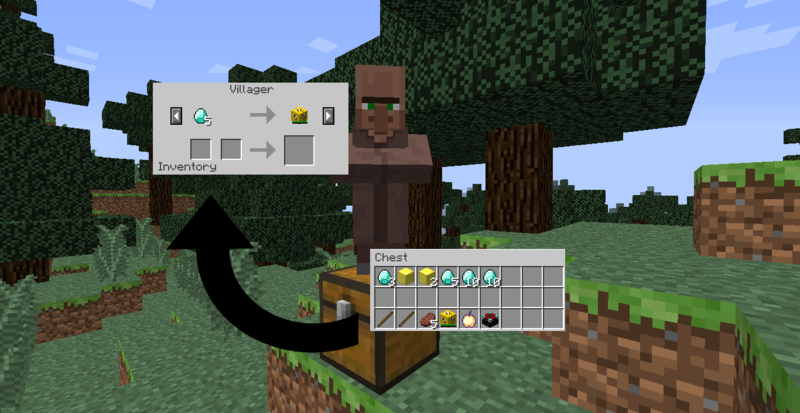 "item.ItemSpawner.name" is supposed to be "Spawn Custom Villager"
Does this mod work now? Is there a config for this item (am missing one so seeing if it is me or if there is none) and is there a way to keep the villager from wandering about? Thanks for the response btw. Be careful how you do it if you disable the ai so it don't affect vanilla villagers. And i was looking for but didn't see any permissions listed for using your mod. I would like to include it in my modpack for client/server. IS there a spot that tells perms in your site I missed or is this even allowed? I am using Version 1.3.3 on MC 1.7.10 and the universal coins mod. I set up a Villager to take different ores and output coins. (This works.) I then move to the next villager and set all of the buyables to the stone tool set (Sword, Pickaxe, Axe, Shovel, Hoe) each one requiring coins from universal coins (Stone Sword = 5coins, pickaxe = 4coins, . . .) when i buy any item it always pulls the first item i have set up in this case the stone sword. Could universal Coins be causing this? I really love this mod, i am setting up a long term Survival world for myself with this and want to use it to make a trade system in my main city.